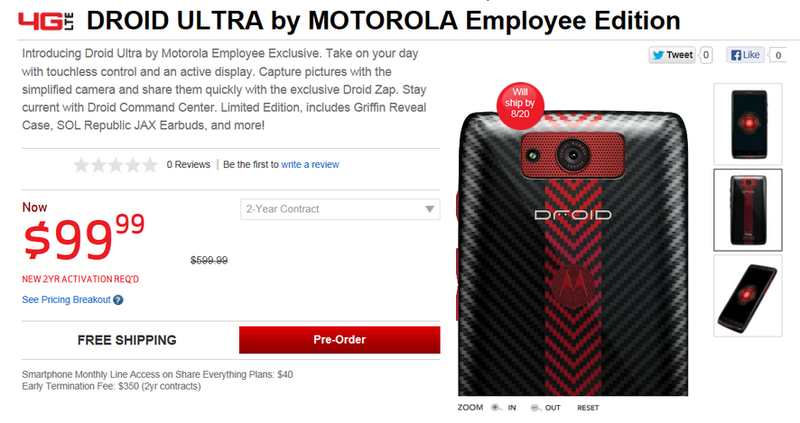 The DROID ULTRA with a red racing stripe down its back that made an appearance yesterday is indeed an exclusive “Employee Edition” of the new Motorola flagship for Verizon. This shouldn’t surprise anyone, since we saw employee exclusives of the RAZR MAXX and RAZR MAXX HD over the last two years, both of which carried limited release colorways. To make the deal worth it for employees, Big Red has priced the device at $99 on contract, and tossed in a Griffin Reveal case and SOL Republic JAX Earbuds. This special edition ships on August 20 with the rest of the new DROID family. Since it’s an “Employee Edition,” don’t expect to pick one up unless some brave employee tosses theirs up on eBay.